When we left school at 8:00 clock and arrived at camp Keswick like 2:00 clock. We had to pack our stuff and then we walked up a mountain and it was like a 3 k walk for dinner we had chicken casserole. Then the next day we went to agradom it was funny part for me is when Max’s dad Max was milking the cow and tried to drink the milk from the nibble and also when the dogs running on top of the sheeps. On Thursday we went to blue lake it was pretty solid because we got to swim in the nice cold water it had no salt water and it was also fresh. 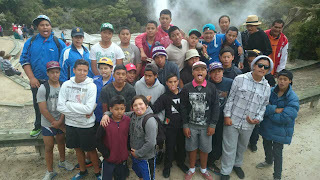 Then we went back to camp grounds and had lunch then we went to the Rotorua pools we got to do some bombs and jump of a tramp into the pools. On friday we went to the luge it was cool going up the gondola. Then we went on the luge it was cool going down the hill fast and turning the corners and sig sags .